The joysticks offered are professional type of very good quality. SmallCab has chosen to equip these SANWA brand round handles made in Europe to guarantee an aesthetic, lacquered and scratch-free finish. 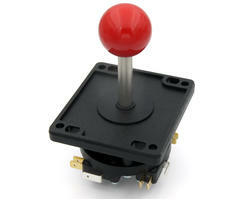 The screw-on arcade button, a high-quality professional material, is the standard button on most arcade machines. The set, typically installed on most machines in the arcade, is the ideal kit for anyone wanting to start in the arcade in good conditions. The kit is offered in 17 buttons (for a RaspBerry distribution). 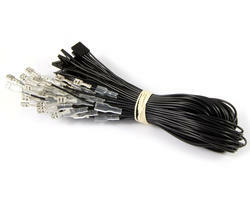 A bundle of cables is included with the kit to connect joysticks and buttons directly to the GPIO port of RaspBerry. Cables 18 wires of 80cm with a dupont connector and lug of 4.8. 8 wires of 80cm with a dupont connector and lugs of 6.3. 2 wires of 80cm with a dupont connector, a common mass chain and lugs of 4.8mm for the buttons and lugs of 6.3mm for the joysticks. 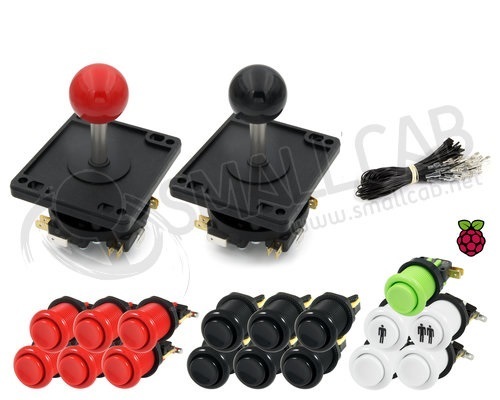 With USB cable and PCB Xin-Mo - 2J 6.3mm: Allows you to move the wiring of joysticks and buttons to a PCB. Also makes it easy to replace your RaspBerry with a PC without rewiring.